It's getting close to JoomlaDay Chicago and I'm excited. We're at a new location and we're offering the Joomla Certification Exam. In talking with members of Joomla User Group Chicago North (JUGCN) and the JoomlaDay Chicago committee, we were trying to find resources to help those looking to take the test. 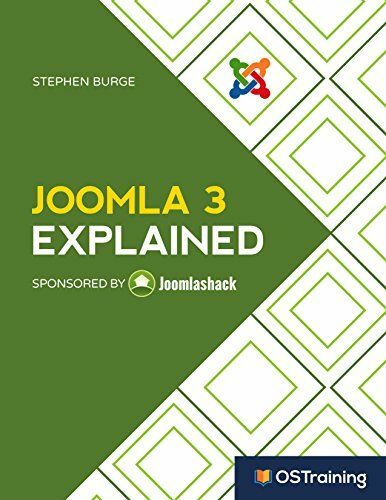 I started reading this book, Joomla 3 Explained, by Steve Burge and OSTraining. I like it a lot, both for its structure and content. I've been using Joomla for about a decade and I still learned a lot. It's because I enjoyed this book so much that I thought it would be a good idea to give away a copy to a fellow Joomler in time to read BEFORE JoomlaDay. So, anyone who is registered by September 1st (including those who registered some time ago - thank you) are eligible to win. You will have your choice of digital or paperback.